Boots on the ground: bengal not happy. 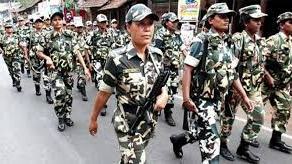 The streets, lanes and alleys of various pockets in West Bengal, including the eastern metropolis, are now filled with the sounds of heavy boots of the central paramilitary forces, as the troopers hold route marches, go door to door warning possible miscreants and asking people whether they are facing threats in connection with the polls. All these activities have angered the ruling Trinamool Congress, and its leaders have gone ballistic against the forces. A former minister has even warned of “mass revolt”. The troopers, who started arriving in the state on Friday — 27 days before the first phase of polls on April 11 — have been visiting vulnerable pockets in the metropolis and the districts in a bid to instil confidence among the voters. The state has a history of political violence, and the panchayat polls last year saw spewing of much blood, with ruling Trinamool Congress winning around 34 per cent of the seats uncontested amid allegations that candidates of other parties were forcibly not allowed to file their nominations. The 10 companies of troopers from the Border Security Force (BSF) and Sashastra Seema Bal (SSB) have now been deployed in Malda, North Dinajpur, Murshidabad, Birbhum, East Midnapore, West Midnapore, North 24-Parganas, South 24-Parganas and Kolkata districts. At Ultadanga in the city’s northeastern fringes, a trooper was seen sternly telling a woman that if her son tries to play any mischief, strong action will be taken. “Koi dadagiri nehi karega (no one can bully) the trooper said. In West Burdwan district’s Andal, that comes under the Asansol constituency represented in Lok Sabha by BJP’s Babul Supriyo, the troopers carried out a route march, enquiring from people whether they were fine. “Is everything okay? Hope you are not facing any problem related to the polls,” a trooper asked an old man Ranjit Dutta. “Is anybody trying to terrorise you?” he asked again. The footages aired on television led to a political slugfest. Trinamool Secretary General Partha Chatterjee alleged the forces were trying to terrorise voters. “Do they have any such rights? We don’t have anything against the deployment of central forces. Their duty is to ensure free and fair polls. For this, they have to depend on the local administration,” he said. Trinamool MP from Barasat Kakoli Ghosh Dastidar took exception, saying she would look into the legal provisions to find out if the commandant exceeded his brief. “Telling people that there should be no disturbances two months before the polls is not the duty of the paramilitary forces,” she said. City Mayor and Trinamool leader Firhad Hakim warned if the troopers visit houses and issue threats, “we will bring it to the notice of the Election Commission”. He alleged that some of the troopers have arrived with “a commitment”. “They have to remain neutral. But if the forces or some of their commandants have come with a commitment, that’s improper. We will draw the attention of the Election Commission,” he said. Going a step ahead, Trinamool legislator Sujit Bose warned that the forces and the commission would have to bear the responsibility if there were “resultant problems”. “The paramilitary forces have to follow certain rules. They can’t go beyond their mandate. If they do so, and insult slum dwellers, then they and the Election Commission will be responsible for the resultant problems,” Bose said. But the sternest warning came from Trinamool leader Madan Mitra. “The way the central forces have started terrorising people, and the way they are creating pressure on the local administration, if there is a public revolt, they won’t be able to tackle it,” he said in Barasat of North 24 Parganas district. On the other hand, the Bharatiya Janata Party mocked the Trinamool. “The central forces are only asking people to cast their own votes, and not to be afraid. Why is the Trinamool all worked up at such a small thing? “Actually they are afraid that if people cast their own votes, it will be the end of the road for the Trinamool in this state,” said state BJP Vice President Jay Prakash Majumdar.